Anti D IgG Monoclonal Blood Grouping Reagent for the slide and tube techniques. These reagents are suitable for use by the slide and tube techniques and are designed for use by operators trained in serological techniques. Human red blood cells possessing the D(Rho) antigen will agglutinate in the presence of antibody directed towards the Antigen. Agglutination of red blood cells with Anti-D(Rho)(lgG) reagent is a positive test result and indicates the presence of D(Rho) antigen. 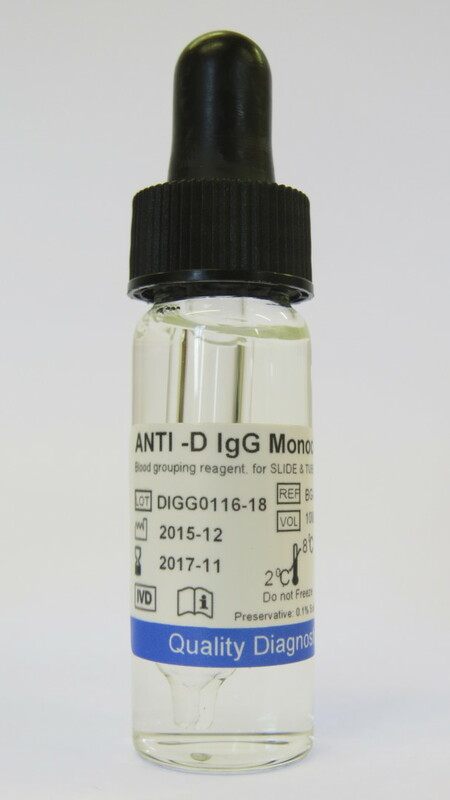 No agglutination with Anti-D(Rho)(lgG) reagent is a negative test result and indicates the absence of D(Rho) antigen. All negative test results should be further tested for Du (Presence of weak / partial D’s) by performing the Du test procedure as described later.